Before watching the film again recently, my most outstanding impression was of a flapping dog door… through which the boy is sucked out of his house and up to the mother ship. I connected that moment with the Gale’s storm cellar hatch being opened and closed in Kansas’ pre-tornado wind… It turns out I did not have an accurate recollection for either film! Still I mention it— because I think even a memory that is distorted reveals an interesting subconscious reflection of WOO’s and Spielberg’s mirror imagery. Actually, it turns out the boy is lured outside by a phantasmal light, much as Dorothy is lured from the sanctuary of her home. Even though the house has carried her safely through the tornado, she is drawn irresistibly out into the magical light and color of Munchkinland…and the dangers waiting in Oz. See Sugarland Express, Saving Private Ryan, 1941, for tempting doorways that prove dangerous. 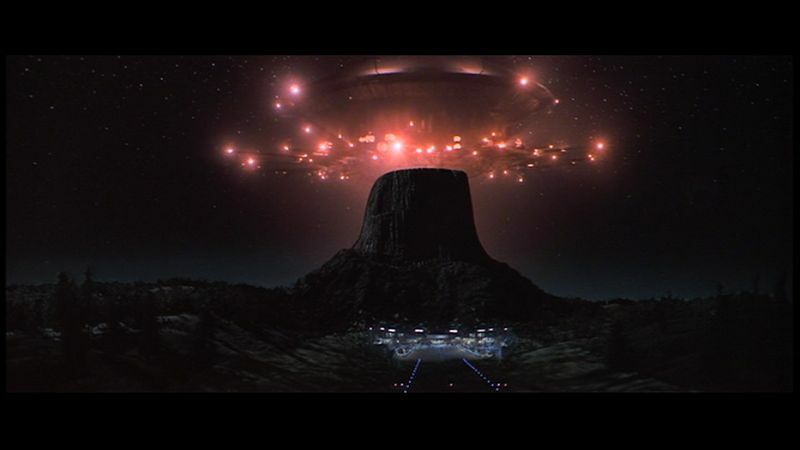 The scene that resonates WOO most for me in Close Encounters is the smallness of the mother and son’s house under that huge storm sky, its utter vulnerability beneath an unfathomable power the clouds are getting ready to unleash. 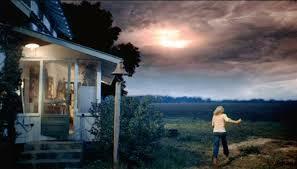 Here we recall the WOO scene of Dorothy running inside her little house. Just as the tornado bears down, the flapping screen door flies off. Home— it feels safe; you crave its security. It’s your haven from an uncontrollable world. But essentially putting such strong faith in that fragile bastion is absurd. Touching, human, but absurd. See Twister, Empire of the Sun, Catch me if You Can, Minority Report, Amistad, The Color Purple, Munich, Poltergeist, The Terminal for examples of home as sanctuary. Devil’s Tower is a dead ringer for the Witch’s mountain castle fortress. 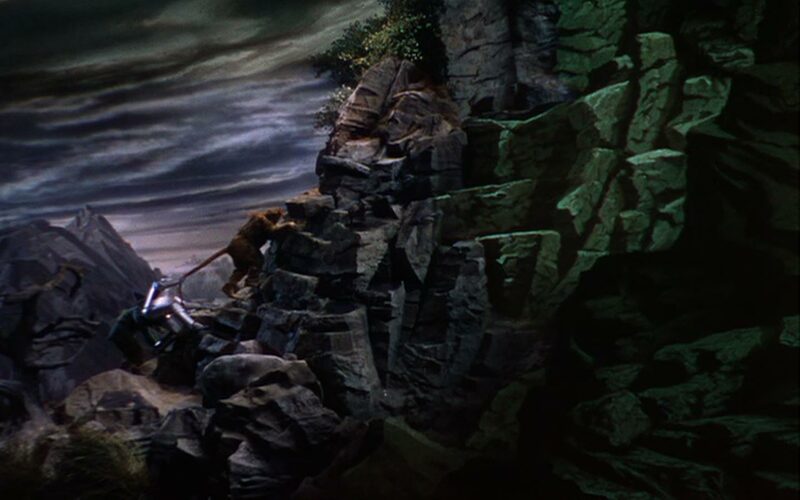 Check out WOO’s scene of Lion, Tinman and Scarecrow climbing to rescue Dorothy and compare it to our heroes’ climb in Close Encounters. When Roy and the boy’s mother make it up Devil’s tower and are peering down into the complex, it reminds you of Scarecrow, Tinman and Lion on top of the cliff checking out Witch’s guarded dungeons. Mommy reuniting with her child to go/be home is one major plot line. See Empire of the Sun, A.I., Sugarland Express, Hook, Saving Private Ryan, War of the Worlds, Catch me if You Can, The Color Purple, Poltergeist, Jurassic Park (to Grampa) and WOO (to Auntie Em) for this variance on the no place like home theme. Can the chimes get any louder??? At the conclusion, Spaceships announce their magic arrival in high decibels upstaging Glinda’s modest harbinger. There are additional examples of tinkling, clinking at earlier junctures in film, warning you of aliens in proximity. See Always, A.I., E. T.,The Color Purple, Jaws, Empire of the Sun, Super 8, Twister, Twilight Zone, Poltergeist, Memoirs of a Geisha for other instances when chimes foreshadow.